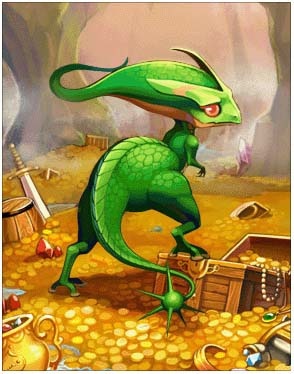 A senior dragon which whole body is green. The most notable part is the fatal hammer tail. It has no interest in money or jewelleries themselves, but its biggest hobby is collecting golden things. It is said that there are countless gold and coins buried in its nest. But the adventurers who planned to gain them always came back empty-handed and even got killed!